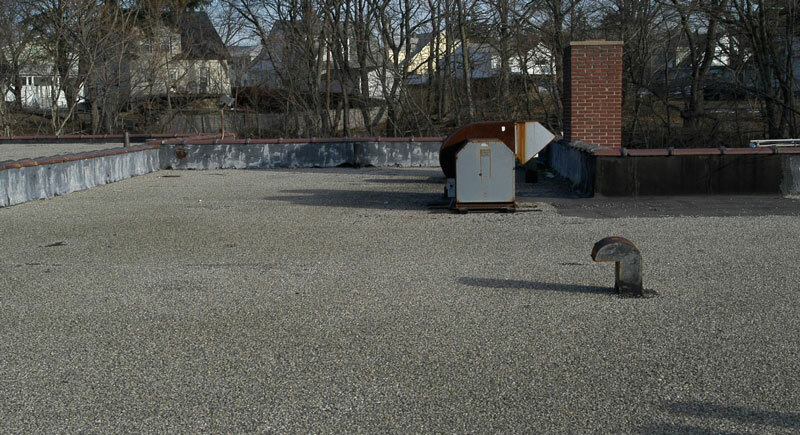 There are 5 types of commercial flat roofing systems commonly installed. We specialize in the 2-Ply Modified Bitumen Torch Down system because of its durability features. We serve Pittsburgh, Harrisburg, White Plains, Stamford and Fairfield CT.
Spray polyurethane foam-based roof systems. This system has been in use in the U.S. for over a 100 years. It is commonly referred to as a”Tar and Gravel” roof. These roofs are composed of layers of asphalt paper and moped down hot liquid tar, which is why it is called “built-up roof.” The paper is layered in a criss cross pattern and depending on the contractor, as many as 12 layers of paper and tar can be used during the installation. The saturated asphalt paper is also called a felt or ply sheet. These roofing felts are reinforced with fiberglass matting. The tar that is used comes in cold solid blocks of coal tar. The asphalt is heated in a kettle with propane gas and then pumped up to the work on the roof. The hot tar then is spread over the work surface with a mop or squeegee and the felt paper rolled out over it. The Asphalt is a petroleum product refined from crude oil. Coal tar comes from the distillation of coal. Either way, the coal tar or asphalt is the adhesive and with the felt paper that forms a thick membrane that becomes the roof. After the membrane has been built-up, a thin layer of asphalt is mopped over the entire roof and aggregate stone of 1/2” is spread over the entire membrane. This stone is used to protect the roof from ultraviolet light. The BUR roofing system can last many decades, but beyond that, there will be a certain amount of degradation. Petroleum based products will become dry and brittle and start to crack due to evaporation causing leaks. The BUR roofing system is very expensive to install due to the labor involved. Some of these roofs have been known to last over 50 years due to the many layers that were used to build the roof up. We have seen roofs with up to 15 layers of paper and tar, but we have also seen that some contractors would reduce the layers to 5 and then only a 3 layer membrane. 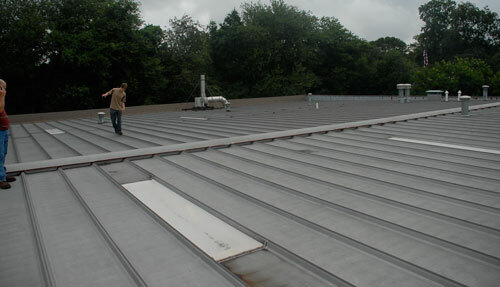 The structural Metal Panel Roof system is the only type of metal roof system used for a low slope application. It is common to see metal panel roofs over warehouses and factories. The metal panels can span up to 4 ft from rafter to rafter supporting the weight of a person. A special sealant is used between seams and overlapping joints to prevent water from entering. Neoprene washers are used where bolts fasten the metal roof to the metal rafters. These metal panels are excellent water barriers and will prevent water from leaking through when correctly installed and can last 4o to 50 years when maintained properly. The Modified Bitumen Torch Down Membrane roof system (MB) was developed by the Italians in the 60s and made its way to the U.S. by the 70s. The 2-ply membrane is made of reinforced fabrics covered with asphalt which consists of modifiers that give the asphalt its elastic properties on both sides. The modified asphalt feels like rubber and the material is manufactured in 36″ rolls. Because of the rubberized technology, these membranes are referred to as rubber roofs or membranes. APP – Polymer – Modified Bitumen membrane. This membrane’s seams are welded together with a torch, hence the name – Torch Down Membrane. SBS – Modified Bitumen membrane and they are installed with cold or hot mopping of tar or asphalt adhesives. Some SBS membranes are self adhering; the backing is very sticky and will adhere to the surface it is rolled onto. The MB roof system is typically installed as a two-ply system, but many roofing contractors will install it as a single-ply membrane. We specialize in the 2-ply system to prevent the premature failure of a thinner membrane’s vulnerability to precipitation and ultraviolet light rays. The MB membranes have 3 types of surfaces: smooth surface, mineral surface, and foil laminate surface. The mineral surface includes a ceramic type of material that helps the membrane to be protected against ultraviolet light rays. In our roofing installation business we have come to specialize in the best use of all these materials and its system; we only use a 2-ply membrane, we use the ceramic surface, and the torch down equipment to provide the best result in commercial roofing. This type of roof system will outlast any single ply system by 30 years or more. In terms of maintenance, the Modified 2 Ply Bitumen Torch Down Roof System, needs minimal to none. Single-Ply membranes, usually referred to as TPO and PVC, are wide sheets of factory-made synthetic rubber or vinyl type of materials. These membranes are usually very thin and come in rolls from eight feet wide to twenty feet wide. These membranes do not come with any protective surfacing. The composition of the top layer is such that it can withstand ultraviolet light rays for only a certain period of time. An adhesive is used to adhere the membrane to the properly cleaned substrate. If the substrate is not properly prepared; removal of dust and particles, according to manufacturers instructions, the adherence is compromised and the life of the roof is reduced. The PVC and TPO membranes are seamed by heat welding with hot air, with the use of solvents, as a primer. EPDM is made from 2 compounds that are derived from oil and natural gas. The inner tube of a tire is the same material as EPDM. The seams are sealed with liquid adhesives or nowadays a special self-adhering tape is also used. Over a short span of time, EPDM has become plagued with problems. The major one deals with the adhesive’s inability to withstand the extreme heat conditions on a roof. Also, the single-ply membrane is prone to punctures and degradation to ultraviolet light.